Short-haired bees, scientific name Bombus subterraneus, where declared extinct in Britain 12 years ago. These bees have been responsible for blossoming flowers across the British countryside which began to lose glory as the bees disappeared. After 12 years of effort about 50 short-haired bees have been released into an English nature reserve on Monday. Hopefully, they will flourish again and make nature flourish with them. With support from the farmers ecologists have setup flowers and plants that will help the bees buzz and flourish once more in the lands they were disappeared from. “Our farmland always used to have wildflower borders. We are just asking farmers to go back to the way things were and the response has been overwhelmingly positive,” said Nikki Gammans, who is leading the project. 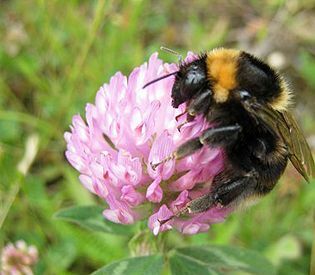 These bees though extinct in Britain managed to survived in Skane, southern Sweden, and following an effort of Natural England, a conservation program that advises the UK government have bought back the bees to Britain. Natural England gave farmers grants to plant flower-rich hay meadows on their land and border their fields with wildflowers to attract bees. Once the wildflowers were in place, Gammans collected nearly a hundred bees from Sweden and held them in quarantine while screening them for parasites. The 51 that made it through the screening process were released into the wild Monday in a nature reserve in Dungeness, Kent in southeast England, filled with wildflowers such as red clover, white dead nettle, yellow flag and tufted vetches. “There are corridors of wild flowers all over the country so we really hope the bees will be able to spread out and thrive in the English countryside again,” Gammans said. Britain has 250 species of bees, but numbers are falling fast, as they appear to be worldwide. A U.N. report last year said the world’s bee population is likely to continue declining unless habitats are protected. Pesticides, wet weather and a parasite called the varroa mite also are hitting numbers. The U.N. estimates that of the 100 crop species that provide 90 percent of the world’s food, more than 70 are pollinated by bees, and therefore the declining bee population could soon hit food supplies. In Britain, both honey bees and wild bees, like the short-haired bee, are under threat. “The problem of vanishing bees is a complex one and there is no single solution, but the planting of wildflowers is enormously helpful,” said Tim Lovett, a former president of British Bee Keepers Association. “Other people can help too, by planting bee friendly plants like lavender in their garden, and local authorities can plant more trees. We all have to do something because we are all in it together. Next: 40% of Accounts on Facebook, Twitter are Spam!